North African cuisine was named by several trend forecasters as an emerging culinary force in 2017. Moroccan cooking may be more familiar to American diners, but Tunisian dishes are coming into their own. They share some of the same Mediterranean ingredients, such as turmeric, cumin, olives, tomatoes, couscous and lemons, but Tunisian dishes tend to be spicier. 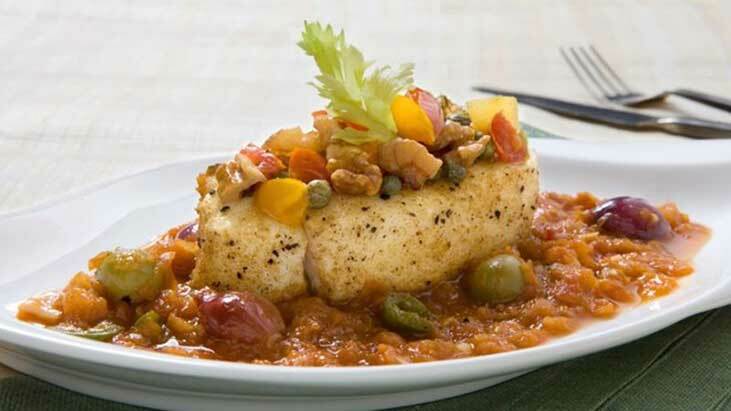 At Mustards Grill in Napa, Calif., chef Pawlcyn uses fresh halibut as the protein, adding cherry tomatoes, capers and preserved lemon peel for authenticity, paired with a scratch-made hot pepper sauce. 1. Prepare fish by rinsing, patting dry with paper towels and dividing into 6 equal parts. Season each piece with salt, pepper and ground cumin. Cover and refrigerate for at least 1 hour. 2. Steam hot pepper and baby onions until almost tender, about 10 minutes. Stem, seed and coarsely chop pepper. Peel the onions. 3. In deep-sided medium skillet, heat 2 tablespoons extra virgin olive oil. Add grated red onion and cook over medium heat, stirring for 3 to 4 minutes until softened. Add tomatoes and cook until excess moisture evaporates, about 7 minutes. Add garlic, tomato paste, ground coriander, olives, steamed chopped hot pepper, baby onions and 1 cup water. Cover and cook over medium heat for 10 minutes. Sauce should be thin, light and very hot. 4. In separate nonstick skillet, heat remaining 1 tablespoon oil over medium high heat. Dust the seasoned fish with flour and fry skin side down in hot oil for 2 minutes, or until skin is crispy. Turn each piece of fish, fry for 1 minute longer, then pour hot sauce over fish. 5. Add cherry tomatoes, capers and preserved lemon peel; reduce heat to low heat and simmer for 1 more minute. Remove from heat; cover and let stand for 15 minutes before serving. Fish will finish cooking in the receding heat. 6. To serve, plate fish on serving dish. Garnish with finely chopped walnuts and chopped celery leaves.